This will be a new one for folks that have been following along here… The American Birkebeiner was my first ski race, so this will be my first ever ski race report… I got some classic skis when I moved to Minnesota 5 years ago and used them a handful of times. I borrowed some skate skis from a friend a few years ago to try them out once and then didn’t get my own until last fall. I got out on my skate skis 3 times last winter and 4 times this winter. So, I am by all means a newbie and just getting started. I’ve heard about the Birkie and skiing is quite popular around here, so it was just a matter of time before I got into it. Plus, Cyclova XC – the shop that I am now part owner of… Is more than a bike shop, it’s a ski shop also! So… I am all in on the ski scene at this point! From my understanding the American Birkebeiner is the largest and longest ski race in the US. It is also part of the World Loppet and racers do travel in from all over the world for the American Birkebeiner. The skate race, which is what I raced… is 50 kilometers long (31 miles) and is hilly. 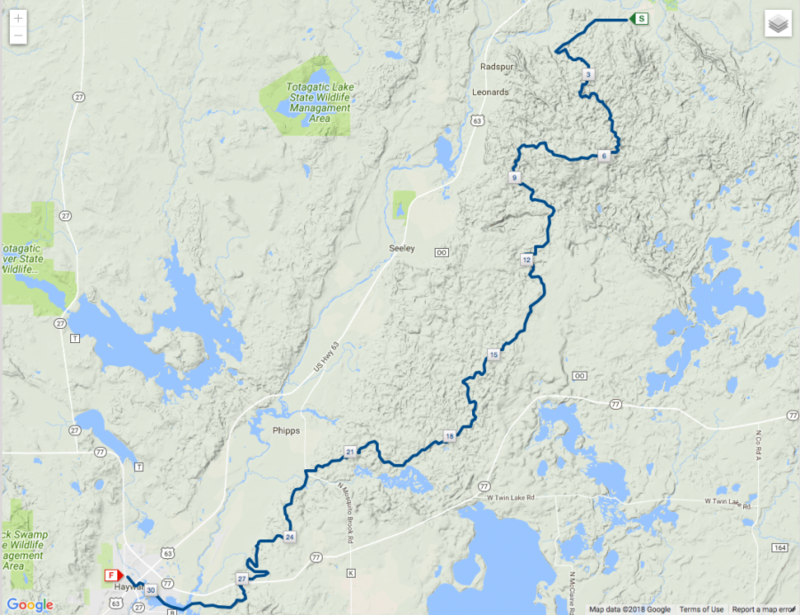 For those that have done the Chequamegon 40… You’ll be familiar with the course as the Chequamegon 40 rides part of the Birkie course, but in the opposite direction. Just know that when the Chequamegon 40 dumps out on fire lanes and gravel roads, the Birkie course is still going up and down hills. You can see the elevation profile below. There were 3,654 people in the 50k skate ski race itself, so it’s a big event. In fact, the start of the race takes an hour to get all the waves started. It’s a lot to take in and the most impressive event I have been part of to date. I now get why people talk about getting Birkie Fever… It’s a really awesome experience and I’m already looking forward to next year. I even pre-ordered a new set of Madshus skis for next year. I didn’t go all the way high end, but I did order a nice set of race skis. We recently put in a big order of skis for Cyclova XC next year and we will have a nice selection of new skis for next year. One note about my race details and report… It gets thin as the race goes on, but I’ve still provided the aid station splits so you can follow along on the course as I work through these. Each section still has its own little detail. It just thins out along the way, but then full memory comes back to me for the final section. The course starts at the official Birkie Trailhead in Cable, Wisconsin and winds its way southwest through the woods to finish in downtown Hayward, Wisconsin. It also crosses the length of a lake just before dumping you into Hayward. It’s a wide path with a couple of road crossings, which is every bit of impressive. They actually shut down route 77 for this race with snow plowed and groomed right across the road for the race. That is some local dedication to a ski race! Speaking of that… They actually shutdown the entire main street of downtown for the weekend, where the finish line is at. They haul in snow and groom the entire street for a nice finish line shoot that has a slight uphill grade. Plus, I have to mention the bridge that is hauled in and assembled just for the Birkie. This bridge is assembled over route 63 to avoid shutting down the entire corridor. There is a lot of work that goes into this event. The skate and classic course both start from the same spot, but split off shortly after starting the race and then reconnect about halfway through the race. This is good as it gives the skaters and classic folks their own course for a good portion of the race and then they don’t reconnect until later when traffic is more thinned out. It’s all hills… There are only a few short spots that level out throughout the entire course, except for the lake crossing at the end of the race. This course makes you work! My Training Peaks account shows me 2,105 feet of elevation gain for the course. You can see that the course works its way uphill from the start, but check out the grade of those hills at the back end of the course. You hit those hills in the last 10k of the course when you’re deeply fatigued. Ski Notes: These skis might be a little short for me and I am also a little heavier than I was last year when I fitted them, so my effective touch points on the skis are fairly short. They feel a little skittish… partly from me still figuring out what the heck I’m doing, but they’re likely a little on the short and soft side for me this year. I have a new pair of Madshus Nanosonic Carbon Skates on order for next year in a 190 length and 60 to 75kg flex range. I would be approaching the high end of the flex on these also if I gained more weight, but I should end up right in the middle of the flex with very little weight cutting. As far as wax… I went with Fast Wax 20 across the board. Wax notes: I did not put on a top coat as I just didn’t think my abilities warranted me putting on a full flouro top coat. I also didn’t follow the exact wax recommendations… Not that I have enough experience to really feel the difference, but I already had some High Fluoro Fast Wax 20 in my personal wax box. I also figured putting on that warmer wax was really only going be relevant for about 20% of my race anyways, so I stuck with the 20 for my final high flouro layer. Additionally, it was going to be cold the night before, so the snow was still likely to be fairly cold, even though the air temps were going to rise later in the race. I think my boots are about a half size too big, so I have a new pair of Madshus Nano Carbon Skates on order for next year. I drove up to Hayward on Friday to pick up my # bib and get my cool Birkie backpack that would be my drop bag for the finish line. You can use the plastic bag they give you or this year you could buy a nice backpack. I went for the backpack as it didn’t cost very much and is a nice pack. Anyways, the expo was cool and I got to see the whole scene on Friday. I didn’t have a place to stay in Hayward, but drove back toward home and met my wife and kids at a hotel in Hinckley, Minnesota. It didn’t save a ton of time, but it did save me about 50 minutes of driving back home Friday night and another 50 minutes of driving toward the startline on Saturday morning. You can pick up your # bib at the startline, but not your backpack and I wanted to check out the whole scene on Friday anyways. Skis all over the place, a huge tent, a barn and tons of people. They had drop bag vehicles all set up and porta-jons as far as the eye could see. It was impressive! I arrived there about an hour before my wave start, just in time to hear wave 1 take off. The race is organized in waves for the start to seperate out the traffic. It works much like the Chequamegon 40 where each time you do the race, you can try moving up waves as you achieve faster finishing times. The difference is, that the Birkie waves actually start at different times and you get the chip start time as long as you are not in the elite wave. I was in the very last wave. As I mentioned above, I was in the last wave (wave 7). I was lined up in the tracks about 4 rows back from the front of the wave. The start ribbon went up and we were off. I was slow… We basically double poled our way out of the start shoot until there was some clearance around us to start skating, but it was really soft. I struggled with it and felt like I was going backwards as people from the rest of the wave started passing me. Shortly after I got to experience the hills that I had heard about after the start, where lines form and you end up just walking up without any glide. After about 5k, I was starting to get nervous about how long of a day this might end up being. I was feeling good fitness wise, but it was slow going for sure. The snow was soft and I was struggling to get in any type of good rhythm. Going into the first aid station… was a new experience for me. It was packed and hard to find a spot to grab a quick feed. There were lines forming as people were looking for fluids. I can’t remember the difference at this point between the various aid stations, but I think I actually stopped and tried to find some fluids at this first one. I noticed this more and more as I moved through aid stations later in the race, but the traffic on the trail seemed to thin out a little more after each aid station. I can assume each aid was picking up more folks that were stopping and taking a little more time to feed, therefore I was moving up the field a bit each time. I really don’t remember the various milestone points on the trail. To me it’s all just up and down hills. However… it’s mostly uphill in the first part of the race. Up to this point was still slow going for me. The trail was still soft, especially on the uphills and I just didn’t have a good rhythm going. I stopped a few times to drink and then dig into some cliff blocks. I couldn’t figure out how to do that while moving quite yet. Finally some sustained downhill sections… I’m not really sure, but I think this is the long Birkie roller climb during the Chequamegon 40, except we went down it in the ski. It was fun and I think it really gave me a chance to get comfortable and find my balance on the skis. Somewhere in this area might have also been the first of those steeper downhills that I had heard about where it’s pretty much frozen toboggan runs from people snowplowing… Even though, I am new to the skiing… I think I have a bit of a comfort level in going fast downhill as a carry over from biking. Anyways, I remember coming into one of them and getting locked into one of the toboggan runs to find myself coming up on a guy really fast. I couldn’t slow down fast enough and he had the brakes on hard. I actually started yelling out to him “go, go, go…”, “I can’t slow down fast enough…”. I ended up coming right up on him about the same time a guy went down next to him… He went down also and then I went down right behind him and then the guy behind me, etc… It was a good show for the trailside crowd that was gathered in hopes of seeing that very spectacle. I think it was around this point that I started getting more comfortable and getting into a rhythm. It’s really hard to say when and where. The Birkie is all up and down hills and I have a hard time remembering back many of the sequence of events like I do with mountain bike races. I do remember specific hills and parts of the trail along the way, but I really can’t remember where some of those hills were actually at. At any rate, I also was starting to get the aid station stuff figured out also by this time. It might have been because the traffic was thinned out, but it seemed like I was able to ski in to the aid station, grab some fluids quickly and be on my way. Traffic was really thinning out after OO and I think this is where the trail widens out for a little bit. I felt ok here and if I remember correctly… I think I was starting to get in a much better rhythm by now and was slowly but surely picking people off and making up spots in traffic from at this point. I think many of the spots I picked up in traffic toward the beginning of the race was more about being efficient in aid stations, but by this time I was actually passing people on the skis. I tried to be as efficient as possible on the downhills and would tuck in as much as possible. You would think the downhills would be a bit of a break, but those quads can start to burn after holding a good tuck time and time again. Then, you’d come right out of that tuck into a double pole and then skate again to get up the next hill without losing momentum. Somewhere in here I took a nice big crash on a slight downhill. I was getting more comfortable to the point that I was skate a little further into the downhills to go faster… I got my ski caught in a rut and splattered myself across the trail. I knew there would be some Cyclova crew out at the Mosquito Brook area, but wasn’t sure if my wife and kids were going to make it over there. I made it to Mosquito Brook and it was cool to see some my wife and kids out there with other Cyclova folks. They all looked like they were having a great time! I didn’t stop though as I was in a good rhythm and kept going. There were a couple of climbs in here that really got me. I was basically to the point that I wasn’t gliding at all anymore on the climbs and was just stepping up them, or at least I remember that for 2 of the big ones. I felt like I was in the home stretch though. I actually skipped this last aid station all together. I finally hit the lake and figured this was it! I picked up the effort a bit and you can see that my heart rate had a bit of a slow and steady climb until the end of the lake crossing, before spiking up a bit at the end. I tried getting in a draft across the lake, but never could quite match someone else’s pace. I didn’t want to hold back at this point and sit behind someone going a little slower than I wanted, but then I couldn’t keep up with some of the other folks that were on the hammer. The lake was also longer than I thought. I felt like it went on forever. I don’t remember the wind being very bad, like I had heard it could be. I was just ready for the finish though. I remember finally hitting the end of the lake and then making a left hand turn and seeing the snow covered street lined with people. My form was horrible at this point and I’m terribly inefficient on skis… I wasn’t fast, but I put in one heck of an effort to get to this point and I started feeling a bit choked up as I realized I had finally made it to the finish. It really hit me when I made that right hand turn and saw the “bridge”… I teared up a little with emotion as I struggled to get up the bridge. My legs were spent. I was a little wobbly by the time I got to the top and had to steady myself a bit before going down the other side… I really didn’t want to crash on main street. I made it! Then, I put in a hard and later confirmed by pictures… one heck of an ugly effort of Main St. to the finish line. That was hard, but that was one of the most spectacular race finishes I’ve experienced! I ended up finishing in 4 hours and 38 minutes and in 2,815th place out of 3,652 racers. Like I said… That’s far from anything fast with the leaders this year finishing just over 2 hours, but I feel decent about my finish with my limited amount of skiing. This whole Endurance Path thing and me getting back in shape was for stuff like this. I never had the Birkie in mind and quite frankly, didn’t know anything about it when I started getting back in shape. But, my reason for getting back in shape was to have the ability to go do things like this on a whim. My entire goal with maintaining a high fitness level was to not to be the fastest guy out there or ever really focus in on one specific thing. My entire goal was to carry enough fitness to be able to go out and do epic stuff like the Birkie and many of the other things I’ve been doing; whenever I wanted and be in good enough shape to enjoy it and have a respectable finish. All that being said, I think as human beings… we like to improve at things that we do. I love continuous improvement both from a professional working/career level and a personal level. I bring up the working/career part as I’ve spent most of my post college career working in some level of continuous improvement capacity and it has carried over to everything else in my life. Anyways, I’m geeked up about improving my ski abilities, just like I work on my biking capabilities each year and now throwing some trail running into the mix. This whole subject could probably use its own write-up down the road. Anyways, I’ll see you at the Birkie next year…! I made the image links clickable to expand so you can open them up to view better if interested. I spent a whole lot of time in my heart rate threshold zone. Note that it was mostly below threshold, which is why I was able to maintain. This fairly significant for me during this time of the year. I’ve done some fat bike racing in the past, but I believe this to be my hardest sustained effort at this level for any activity in the winter. It bodes well for my current fitness as long as I can carry this into the spring/summer without crashing. This is just another look at the length of sustained effort. My heart rate threshold on the bike is over 170 and I am probably in the best all around cardio condition that I’ve ever been in. Which can be taken 1 of 2 ways… It’s really great situation because it’s winter and I haven’t ramped up any serious training or 2… I’ve just used up one of my peak conditioning periods for the year and my target season hasn’t even started yet… Time will tell, but I think it’s the first one and I’m just starting out the year in a really good place relative to past years. This is just the splits from each section of trail. Feel free to follow along on my Strava account if interested. A friend passed me this book a couple years ago and this helped inspire me to get into skiing and eventually take on the Birkie. I also know the author of the book now as well. It’s a great read and you would enjoy it, even if you are not into skiing. FYI… It’s also an affiliate link, which I don’t do often, but I will get a small commision from Amazon if you make a purchase after clicking the link.